As a pet owner, you know how hard it can be to travel with a pet. Vacations and road trips, though, can be a lot more fun if you share them with your best friend! If you plan on taking your pup with you on your next road trip, be sure to make the proper safety precautions to make traveling more enjoyable for both of you. We have some great tips for you to help make your journey with your pet on the road comfortable and fun. Check out our 7 tips below to get started. Prep Your Pet – A few weeks before your trip, start getting your furry friend geared up for the long journey ahead by taking him or her on a series of short drives first. This will help get your pup used to the longer duration of car rides. In time, you can gradually lengthen the subsequent trips. Always ensure that your pet is secured in a crate that won’t slide or shift in the event of a quick turn or stop. Harnesses that can be secured to safety belts in the car can also work in place of crates. Give Your Pet Identification – You should always have tags on your pet or have him or her microchipped in case they are lost, but before a trip, do make sure they at least have tags that include your name, address, and a phone number to reach you in case someone finds your pet. Remember to carry a clear photo of your dog with you in case your best friend and you get separated on your journey. Keep Him Inside – When the vehicle is moving, make sure that all heads and paws are inside, no matter how badly your pup wants to feel the wind blow in his face! Remember, your furry friend could easily get injured by flying debris and objects if his or her head is sticking outside the window. Keep your buddy inside! Know When To Feed Your Pet – Animals tend to not eat when they’re nervous or feel threatened. Be sure to keep your pet’s mind at ease by giving him or her a light meal three to four hours before you leave. Refrain from feeding your pet in a moving vehicle, even if the drive winds up being long. Instead, make pit stops for your buddy to eat and also to stretch his or her limbs and potty. Remember the Records – If you plan to travel across state lines, please consider bringing along your records of your pet’s rabies vaccinations. Usually you won’t be asked, but certain interstate crossings require proof, so be prepared and bring the records along with you! You can get these records from your veterinarian. 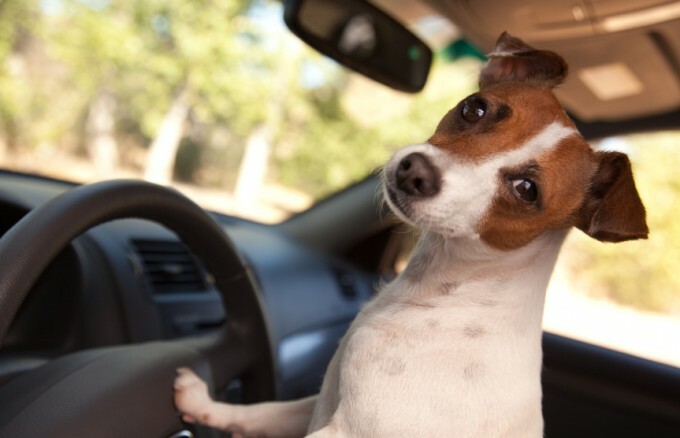 Never Leave Your Pet In a Car – This rule might seem to be implied, but countless pets are left in parked vehicles every day. NEVER leave your pet within a parked automobile! On a hot day, a parked car can become fatally warm in mere minutes, and during the winter, the car will act as a refrigerator and retain the cold, and your dog won’t be able to tell you if he or she is feeling too hot or too cold. Don’t take a chance – never leave your pet in a parked car, not even for a minute! Sometimes your best friend isn’t able to go on road trips. Maybe the person you’re visiting is allergic to pet dander or the hotels you researched don’t allow pets. If that’s the case, leave your dog in the best care possible here at BauserHaus! Your dog is sure to enjoy his stay here with a lot of other great, playful, and well-behaved pooches. Visit us online at www.bauserhaus.com or call us at (314) 961-3911 to find out more! This entry was posted in Tips and tagged BauserHaus, doggie daycare STL, how to take dog on vacation with you, road trip tips for dogs, travel tips for dogs. Bookmark the permalink.